The National Institutes of Health (NIH) has awarded $1.5 million to UC Santa Cruz for a powerful new instrument used by chemists and biochemists to explore the structures and functions of complex proteins involved in human health and disease. The grant from NIH's High End Instrumentation program funds the acquisition of a new electron paramagnetic resonance (EPR) spectrometer to be based at UC Santa Cruz and used by researchers from around the San Francisco Bay Area. In particular, the new instrument will provide a state-of-the-art platform for performing DEER (double electron-electron resonance), a powerful technique for solving challenging problems in structural biology. 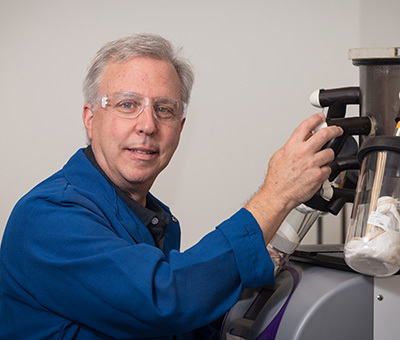 Glenn Millhauser, professor of chemistry and biochemistry at UC Santa Cruz, is the principal investigator for the grant and an expert in the field of EPR. "What's great about DEER is that we can get snapshots of how proteins change shapes as they perform their functions, and how mutations in disease inhibit proper function," he said. "We can also use it to get insights into the arrangement and organization of large multi-protein complexes when we know only the structures of individual protein building blocks." In his own research, Millhauser uses DEER to study prion proteins, which contribute to neurodegenerative brain diseases such as Alzheimer's and Creutzfeldt-Jakob disease (CJD). Other UC Santa Cruz researchers who will use the facility include biochemist Nikolaos Sgourakis, who studies T-cell receptor proteins that play a critical role in the immune response, and biochemist Carrie Partch, who studies the biological clock that drives circadian rhythms. Other major users of the facility include scientists at UC Davis, UC San Francisco, UC Merced, and Stanford University. Biochemist Andy LiWang at UC Merced and David Britt at UC Davis, for example, both study biological clocks (and LiWang has collaborated with both Partch and Britt). William DeGrado at UCSF studies histidine kinase membrane proteins (important players in bacterial sensing mechanisms); James Ames at UC Davis studies calcium-binding proteins essential in vision; and Liang Feng at Stanford University studies glucose membrane transporters. Many of these researchers have been using the existing EPR equipment at UC Santa Cruz, which has been through several upgrades since it was originally installed in 1989. "The new instrument will be much faster and provide finer data. What now takes us a day will only take an hour on the new instrument," Millhauser said. "This facility is going to be unique in the Bay Area." A major NIH grant in 2015 funded the acquisition of a $2.5 million NMR spectrometer for the facility, which Millhauser said is "humming all the time." He noted that NIH only funds about 25 high-end instrumentation grants nationwide every year. With this level of intense competition, the two recent grants awarded to UC Santa Cruz are indicative of the campus's stature in the area of biological magnetic resonance. "The EPR instrument will complement exciting efforts in magnetic resonance in a number of research labs here at UC Santa Cruz and across the Bay Area," Millhauser said.